Hi, when I hit golf balls I come over the top and usually pull the ball. 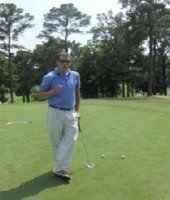 But when I hit an impact bag my right shoulder stays back at the beginning of the downswing and the club shaft swings down from the inside bisecting my right arm halfway down(looks just like the pros). I have been videotaping my swing and transferring it to dvd and watching it frame by frame. What makes this happen? The impact bag swing is a great way to help with over the top, steep attack angles to the ball as you have seen in your videos. The reason your right shoulder stays back with the impact bag is because are developing the correct sequence for your golf swing. The lower body in conjunction with your shoulders will dictate how your club comes down from the top of your backswing. Most players that struggle with pulls or fades, even slices are players who over rotate their hips along with their shoulders at the start of the downswing. The reason this happens is due to the belief that you must rotate your hips literally in the downswing and follow through. The end result is over doing it which leads to the most common swing fault in golf, the slice. When practicing with an impact bag you are teaching yourself the proper release timings of the 1.hips, 2.shoulders, 3.arms, and 4.hands in your swing. Most importantly, you are developing more of a slide/delay of your hips. I can not stress how important it is to focus on the delay/slide of your hips as this is one area that will play a major factor in where your club shaft bisects your body. 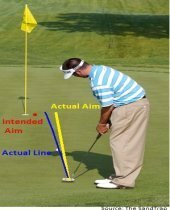 To prove this, take a club and use a mirror positioned down the line where your video camera would be. Position yourself at the top of the backswing and while looking in the mirror move your hips toward the target. If you do this correctly you should notice that the arms and club drop to the inside without knowingly moving the shoulders, arms, and hands. I hope this explanation concerning the impact bag swing has helped you understand why your right shoulder is staying back in the downswing. If you have any further questions, please comment below.